Tearing Of The Temple Curtain: Why Was This Significant? When Jesus died on the cross, the temple curtain (also known as the temple veil) was torn. Why did this happen? What was the significance of the veil being torn and why was it torn from the top down? The veil was a long, woven curtain that was purple, scarlet and blue. This curtain or veil was for the purpose of separating the Most Holy Place which held the Ark of the Covenant and the Mercy Seat. Sitting on top of the Ark was a gold lid. This was the place for the propitiation of sins by the sprinkling of the innocent sacrifice’s blood. Only the High Priest could enter this Most Holy Place and only then, once a year on the Day of Atonement. Propitiation simply means the appeasing of the wrath of God for the sins of mankind. It provided satisfaction for God for the sinfulness of sin. If anyone simply walked behind the veil and they were not the High Priest and they did not do so on the Day of Atonement, that person would immediately die. It was a protection against a casual act of infringing upon the Most Holy Place which represented the very real presence of God. No one could look at God and live (Exodus 33:20) because He is a consuming fire (Deuteronomy 4:24, Hebrews 12:29). The Shekinah-glory that was shining above the Mercy Seat would annihilate anyone but the High Priest and so the temple’s veil protected humans from instant death. The veil was a symbol of the separation of God from sinful mankind. It marked the boundary between God’s pure holiness and the wickedness of mankind. It was not possible to go beyond the veil because our sins have separated us from a Holy God. The profane and the Holy can not be joined together. Why was the Curtain Torn? Because of Jesus we now have access to the very throne of God. Jesus died at the exact moment that the sacrifice for Passover was held. At that same time that Jesus breathed His last breath, the temple veil was rent. The veil’s being torn, by God Himself, symbolized the fact that mankind’s separation from God had been removed by Jesus’ supreme sacrifice at Calvary. Since Jesus was without blemish, without sin, and kept the Law perfectly for us, His death was the propitiation or satisfaction of the wrath of God against humanities sins. Isaiah 59:2 declares that “your iniquities [or sins] have separated you from your God; your sins have hidden his face from you, so that he will not hear you.” Now that Jesus’ once and for all sacrifice was given, we now have access to the very throne of God. Before, He would not even hear us, not to mention allow us to approach Him. The veil was not a small curtain like you see in some movies. The veil was 60 feet long, 30 feet wide, and was four inches thick. The veil was so massive and heavy that it took 300 priests to manipulate it. An important point here is that no one could simply tear the veil themselves. It would take more than human strength to tear it. The analogy is that it took the mighty hand of God Himself to tear it supernaturally and this tearing, which represents the removal of the separation of God and man, could not be done by humans. It had to be done by God alone and that’s the point. No one can remove our separation from God but God Himself (Isaiah 59:2). First John 2:2 says that “He [Jesus] is the atoning sacrifice for our sins, and not only for ours but also for the sins of the whole world.” Since Jesus’ death atoned for our sins, Jesus’ sacrifice allowed for the veil to be torn and thus, the separation between God and man was able to be removed. The fact that the veil was torn from the top down, some 60 feet from the floor (where humans could not reach it), shows that God was the One that caused the veil to be torn. He is the initiator of the veil being rent. He is the cause of the tearing. He, in Jesus Christ, is the reason it was torn. It is no coincidence that the temple sacrifices by Jewish Christians ceased that year and for the years to follow. Why? The sacrifices were stopped because of Jesus’ offering of Himself. The temple priests did not accept Jesus’ sacrifice in place of the animal sacrifices but believers in Him did. The Book of Hebrews was written specifically to Jewish Christians but the applications for us are the same. Hebrews chapter 10 reveals that no other sacrifices where given, at least by the Jewish Christians. Luke’s account of the birth and early history of the church in the Book of Acts never mentions any of the Christians continuing to sacrifice. They understood that the veil had been removed by Jesus’ offering on the cross and therefore, there was no further need to provide sacrifices, even at Passover or on the Day of Atonement. The significance of the veil being torn from the top down, and the fact that was torn, is that Jesus’ sacrifice makes it possible for us to come to God the Father. Our sins no longer separate us from Him. Today, for those who put their trust in Jesus, we have access to God. Second Corinthians 5:21 explains that, “God made him who had no sin to be sin for us, so that in him we might become the righteousness of God.” The fact is that Jesus Himself was torn for our sakes (Isaiah 53). Our High Priest today is Jesus Christ Who continues to intercede for the saints. This is one of the chief purposes for the writing of the Book of Hebrews and makes the perfect conclusion of why the veil was torn and why it was torn from the top down. Jesus “became a priest with an oath when God said to him: “The Lord has sworn and will not change his mind: ‘You are a priest forever. Because of this oath, Jesus has become the guarantor of a better covenant. Now there have been many of those priests, since death prevented them from continuing in office; but because Jesus lives forever, he has a permanent priesthood. Therefore he is able to save completely those who come to God through him, because he always lives to intercede for them. Such a high priest truly meets our need—one who is holy, blameless, pure, set apart from sinners, exalted above the heavens. Unlike the other high priests, he does not need to offer sacrifices day after day, first for his own sins, and then for the sins of the people. He sacrificed for their sins once for all when he offered himself. For the law appoints as high priests men in all their weakness; but the oath, which came after the law, appointed the Son, who has been made perfect forever” (Hebrews 7:20-28). THANK YOU Jack …. for this message. I recently found this site (a week ago) when I was searching for more in indepth understanding about the story of Job. Specifically, how did Job get through his pain. Unlike Job, I am responsible for my circumstances. Under great psychological and emotional stress….from a life change/loss….caused by my actions and sins….I am seeking once again, God’s help. Not having sufficient awareness of God’s desire for us/me, I’ve been reading this site’s archives and daily messages. I know that my self loathing and distress are a direct result of not understanding God’s message, and offer to others and me. Your message about the torn curtain and the resulting communion between us and God is wonderful. It is helping me to feel that there is hope I can care truly for others…and in doing so, myself. Your explanation of how simply and divinely we/I can understand my purpose, is helping bring calm in my heart. There has been too much self centeredness and defensiveness in this life of mine. I’ve said so many times, in rebuke, that “It’s not just about me.”…but in most cases, it has been just that. Your messages indicate a great understanding of God’s purpose and love for us. PLEASE keep offering your thoughts and messages about how we/I can move from our mistaken paths, into God’s path for us. I’m trying to daily, hourly, instantly….conciously believe in my heart/core that only a concentration on loving others has value. Thank you Mr. Bowers. I will be honored to pray for you sir. I can see that the Holy Spirit has been and is working in your life for God grants repentance and He is working in your life obviously for no man confesses Christ and the need for Him as their Savior unless the Holy Spirit is in him (or her). I am so pleased that you could understand and what is significant is that I myself caused Jesus’ flesh to be torn so that our separation from God could be ended and the wrath that rightly belonged to me was placed on Him who knew no sin so that we might be seen as His righteousness (2 Cor 5:21). Thank you for this beautiful write-up appropriate not only for general education but also for the spiritual growth of Christians. May the good Lord continue to use you and your medium in promoting and spreading the Good News. Glory to Jesus. Thank you so kindly sir. When I wrote this and did some research I was more amazed at just how much God has done thru His Son to remove the separation between me, a sinful creature, and the holy, divine, and perfect God. Is there any mention, outside of the Bible, of this event taking place? Do Jewish scholars deny that the curtain was torn? An event this significant surely could not have escaped the notice of the priests and temple worshippers of the time. Thank you Jocelyn. Great question. The Jews of Judea were practically eradicated by the Romans less than 100 years later. Almost everything that we knew of the Sadducees and Pharisees prior to the discovery of the Dead Sea Scrolls came from the passing mention of their beliefs found in the gospels. In other words, very, very little in the way of contemporary records has survived from that time and place so you will not find a great deal of historical evidence for this but there is at least some. Indeed – we only knew of Pontius’ Pilate’s position from The Bible until the discovery of the Pilate Stone in the 1900s. People used to claim “proof” that The Bible was false by pointing out that there was no record outside of The Bible that Pilate held the position mentioned in The Bible. Today we have evidence of his existence both by historians and by archeological finds of his remains. I am sure there is more than this but the fact that the Bible declares it as so is ultimately enough for me for the Bible is true and we can believe every word of it. I hope this helps Jocelyn. 1. Alfred Edersheim, The Life and Times of Jesus the Messiah (Grand Rapids: Eerdmans Publishing Co., 1973), Part 2, p. 610. The sources are Tacitus (Hist. V. 13), Josephus (Wars of the Jews VI, 5, 3) and the Talmud (Jer. Yoma 43c; Yoma 39b). Thank you for your most helpful response to my question. And I completely agree that the fact that the Bible speaks to this event is all the “evidence” that I need. This a great article, something that I think all believers should understand. Especially with the Easter season fast approaching, it is great to meditate upon how blessed we are to have direct access to God through Jesus our Savior. Well done brother. AND … CONGRATULATIONS on your 200th article at WCWTK. Your articles have been an inspiration to so many and your knowledge of the Bible continually blesses our readers and me. So happy to be co-laboring with you brother. Thank you but truly all glory, honor, and credit go the our Great King, the Great Son of the Great Father, Jesus Christ to HIM be all glory. The messenger is nothing! The message is everything. Along with Pamela Rose, CONGRATULATIONS!!!! 200 articles!?! Wow! You’re truly an instrument of the Holy Spirit, Pastor Jack. Never really understood the meaning of the torn Temple’s curtain when Jesus died. Thanks for explaining so simply, even this dense skull can comprehend! Can you explain the following in Luke 20: 27-47…Jesus’ reply in passages 34-38? (This was part of the bible study today I’m taking online.) I slowly read it a few times, but could not understand Jesus’ meaning at all. The human in me is simply dense, dense, DENSE!!! So thankful God has patience with me and for fellow Christians like you and everyone at WCWTK. Please, also pray for hubby, Gary, who’s been in hospital since early Saturday morn. (Infection around catheter, used for home dialysis.) Thought for sure Gary was coming home today, but doc’s not pleased with results of dialysis. Gary’s spirits are alright, in fact, he said to me over phone earlier, that he felt like Job! Hee-Hee! Of course, he was exaggerating; to have FAITH like Job did thru all the tribulations he suffered, all I can say is, WOW! Patty. I can see the strong work of the Holy Spirit in you for you have such a hunger for the Word of God and that is fruit that bears your being saved…not that I had doubts but few Christians today seem to want to study the Bible and this seems wrong. So my compliments on that. I believe what Jesus is saying that in this age, before Christ comes to rule in the Kingdom of Heaven, people are still getting married but when the rule of Christ on earth begins after His return, we’ll be like the angels and not be marrying anymore but will have eternal life and have no need for procreation (bearing children) and be like the angels in this regard. Not that we’ll sprout wings but we will have eternal life like them and not marry, like them also. Make sense? And you are NOT dense…you are studying to know more about God so that you are more like Christ. Those who are densest are more often on Facebook that getting their face in THE book (the Bible). My compliments. Thank you very much for the time you took to make the research. I have been blessed by this. Pray steadfastly, read God’s Word, and hang in there for all the wonderful blessings God will give you and your family, Thomas! Thank You so much Patricia. Such a great kindness. I came back to Mr. Wellmans message this afternoon because I was feeling alone and so unworthy. Your message has helped lift some of the weight off my heart. I know I’m blest….but weak too. I feel like we just had a conversation between two friends. Thank You. I agree totally with Mr. Wellman, You are NOT NOT NOT dense. I need soooo much help when trying to better understand many scriptures. I will pray for Your Husband and Your Family. Thank You dearly. Thanks so much for your quick reply, Pastor Jack! Yes, I DO understand Jesus’ meaning now. Wow, HEAVEN is going to be such an exciting, eternal existence! Continuing from above…for some reason, my hitting a wrong key, most likely, reply got posted before I could finish. Our Heavenly Father, God, is simply WONDERFUL in ALL HIS BLESSINGS, isn’t He, Pastor Jack? Hi, Pastor Jack! Changed the online bible study to the New English Version. (Think that might have been the problem understanding Jesus’ reply in Luke 20: 34-38…yeah, copied the #’s from above, ahem~.) I understood your explanation completely! Didn’t know the King James Version used the rhetoric of their days. (Did I use ‘rhetoric’ correctly?) Thank you again, Pastor Jack! Going to reply to Thomas Bowers above. OK? Hello, Thomas! Your reply was sweet. Really happy I could help, and yes, I also felt like it was between two friends…more like brother & sister in Christ! Right? Thank you for INSISTING I’m not ‘dense.’ As I told Pastor Jack Wellman, most of my life, my family & friends have called me this. Being hearing-impaired, guess they figured I was ‘dumb,’ too. THANK DEAR GOD MY FAMILY NO LONGER TREATS ME THAT WAY ANYMORE, HAVEN’T FOR A LONG TIME! As for friends, I choose ones who accept me as I am. Who needs negative feedback from others, right? Looking forward to your comments & questions on other topics this site, WCWTK, carries. All the writers of articles with Scripture passages are truly inspired by the Holy Spirit, but Pastor Jack is my favorite. His writing style just clinches God’s Word for me. Also, thanks so much for prayers for my hubby, Gary. He’s still in hospital, on antibiotics for catheter infection. His spirits are overall up, but oh, I miss him! So does our beagle, Sherry! Hee-Hee! She’s really close to Gary! Keep praying, turn to God’s Word or this site when you get overwhelmed by life’s nutty paths. Reminder, you are in my daily prayer journal, Thomas! Oodles of blessings from Our Heavenly Father, God, Thomas! Thank Sir you have really enlightened my spirit now I understand why the curtain was torn, I have got a right to stand in the presence of God without guilty conscious. Thank you Ntuthuko for your gracious words. We have no right to stand before God but only because that Jesus became sin for us and that God sees us as having His righteousness (2 Cor 5:21). I love this site !!!!!!!!! Thanks for all you’re doing to help us understand . I had asked for prayer and I know you all did for me , see another person has asked , I will remember him in prayer too with all of you . I heard Charles Stanley say if GOD sent Jesus , and Jesus did die for us don’t we think it would be right to live for HIM , something to that effect , made me think of just how much has been done for me/ us , and how very little I have done to appreciate it . Thank you so much Nicholas. Dr. Charles Stanley is rock solid as a teacher and pastor. Great to know you listen to him. I myself have done not enough for our Savior and to Him, all I owe I could never repay. The rent temple curtain is just such a wonderful thing to know that He Himself tore this separation for us who didn’t deserve it. Very informative. What was the purpose of the ancient temples? and what is your opinion on why there are no temples today? Thank you Kevin for your question sir. The purpose of the temple was to make offerings for sin and it was an ongoing process sins Hebrews states it is not possible that the blood of bulls and goats could take away the sins of the people. When Jesus died at Calvary, the temple’s purpose was not needed any longer for Jesus Himself became the sacrifice that was sufficient for all of the sins of all the people and for all time. Today, Christians are the temple of the Holy Spirit for He dwells in those who have put their trust in Christ. I pray I answered your questions adequately. I NEED TO SHARE , I AM HAVING A BAD NIGHT AT WORK , SEEMS ALMOST IMPOSSIBLE TO DO ALL I AM ASKED AND THEN MORE IS ADDED ON OR COMPLAINED ABOUT , I KNOW GOD IS WITH ME , I WOULD JUST LIKE PRAYERS TO GO OUT FOR ALL THE PEOPLE WHO WORK UNDER ME TO GIVE THEIR BEST , AND THOSE OF MY PIERS TO HAVE AN UNDERSTANDING HEART THAT I AM TRYING MY BEST TO DO ALL I CAN ………. This is for Nicholas above (April 29, 2013)…OK, Pastor Jack? Boy, can I relate to having a “bad night’ at work! When I used to be out in the work-force, there were a few too many “bad times”, my thought were definitely non-Christian! LOL! You sound like you have a beautiful soul, Nicholas! May Sweet Jesus’ Holy Spirit continue to guide you every step of your journey here on earth. Amen. THINGS ACTUALLY WENT SO MUCH SMOOTHER COME MORNING , GOD WAS SURELY WITH ME , AS HE IS ALWAYS OF COURSE , FEELING HIS PRESENCE IS SO WONDERFUL , HAVING OTHERS WHO LOVE GOD SAYING PRAYERS FOR YOU IS WONDERFUL TOO . THANKS SO MUCH AS ALWAYS !!!! I THINK SOMETIMES YOU MAY EVEN DO MORE THAN YOU MAY REALIZE BY HELPING ANOTHER . Nicholas….Patty and others are very special on this website and are prayer warriors. May God continue to bless you and be with you my friend. You are most certainly not alone my Nicholas. PS, thanks Patty. You’re a treasure. This is for Frank (May 10, 2013.) OK, Pastor Jack? Oh, please, DO write your “long comment,” again! Jesus’ Holy Spirit will help you remember what you wrote. I do the same thing too often for comfort, you’re right, Grrrrrr~! I’m forever hitting the wrong key on keyboard~! Since you’re part of our family here on WCWTK site, you should know how beneficial others’ comments are, and the writers of this site do appreciate feed-back. So, think about it, OK? I WANTED TO THANK YOU ALL FOR THE PRAYERS FOR MY MOTHER-IN-LAW , SHE WENT ON TO BE WITH THE LORD THIS PAST FRIDAY EVENING AROUND 7:30 , MAY THE 10TH , I HAD ASKED HER WAS SHE SURE OF THINGS WITH THE LORD AND SHE HAD TOLD ME YES , THAT WAS GREAT TO HERE . MY STEP DAUGHTER HAD EARLIER IN THE WEEK TOOK MY WIFE’S A.T.M. CARD AND VIRTUALLY CLEANED OUR ACCOUNT OUT , MY WIFE CHECKS IT ALMOST DAILY , AND WITH HER MOTHER BEOING ILL HADN’T GOTTEN TO DO THAT , THE BANK HAS PLACED THE FUNDS BACK ,, SHE TOOK AROUND $ 2000.00 , IT HAS JUST HURT US TO THE CORE THAT SHE DID SUCH A THING , SHE EVEN TOOK AN AMOUNT LATER FRIDAY NIGHT , AND DID NOT COME HOME , AFTER TELLING HER MOTHER SHE WAS JUST WANTING TO USE THE CAR FOR A MINUTE AND SHE’D BE BACK SOON . THE BANK SAID SHE WOULD BE CHARGED 13 TIMES THAT IS HOW MANY TIMES SHE HAD WENT TO DIFFERENT A.T.M. MACHINES AND WITHDREW FUNDS . DRUGS HAS RUINED HER LIFE IT SEEMS , ONLY THE LORD CAN MAKE A DIFFERENCE . WE HAD SET OUT NOT TO ENABLE HER IN ANY WAY AND THIS HAPPENED. IT HAS JUST AMAZED US HOW SHE COULD BE SO UNCARING . WE TOLD HER WE LOVED HER BUT CERTAINLY HATED HER WAYS , AND SHE CAN NOT COME INTO THE HOUSE FOR ANY REASON . WE HAVE DONE SO MUCH FOR HER , SHE HAD HER 2 SONS TAKEN AWAY BY D.S.S. , AND MY WIFES AUNT AND UNCLE HAVE THE OLDER SON AND HER COUSIN AND HIS WIFE THE BABY SON . MY WIFE WAS SO FRANTIC AT FIRST WHEN SHE REALIZED THE BANK ACCOUNT , WE HAVE BEEN FORCED TO DELAY FUNERAL SERVICES , AND WE DIDN’T KNOW HOW WE COULD PAY ANYTHING AT FIRST . MY MOTHER ENJOYS FINDING FOUR LEAF CLOVERS , AND ALTHOUGH WE ABSOLUTELY DON’T BELIEVE THEY WILL BRING GOOD LUCK , I HAD SEEN SO MUCH CLOVER IN THE YARD , AND I HAD LOOKE FOR A 4 LEAF JUST FRO FUN FOR A COUPLE OF WEEKS , WELL I WAS SO UN-NERVED IF THAT’S A WORD I TOLD MY WIFE I WAS GOING TO JUST STAND OUT ON THE FRONT PORCH , AND AS SOON AS I WENT OUT I LOOKED DOWN , AND A 4 LEAF CLOVER LOOKED AS IF IT WERE LOOKING BACK AT ME , AND I WENT DOWN AND PICKED IT , I WENT IN AND SOME MAY DISAGREE WITH ME BUT I SHOWED MY WIFE AND WE BOTH CRIED , AND BOTH OF US JUST FELT THAT THIS WAS AN ANSWER THAT ALL WAS GOING TO BE OKAY , AND IT HAS BEEN IT SEEMS , WITH SO MAY GOOD FOLKS COMING TO OFFER ANY WAY OF HELPING OR JUST BEING SO FRIENDLY , WE HAVE TRULY PRAISED THE LORD !! I HOPE THIS WILL BLESS SOMEONE WHO READS THIS , TO SHARE THAT WHEN WE ARE OUR WEAKEST , WE ARE OUR STRONGETS BECAUSE WE ARE SOLELY IN THE HANDS OF JESUS OUR WONDERFUL SAVIOR , AMEN , PRAISE HIME PRAISE HIM PRAISE HIM !!!!!!!!!!!!!!!!! Hello Joan. It actually was 4 inches thick, so you are right. It should have read 4 instead of 1. Thank you. Thank you for the article. I heard that there were number of curtains/veils in the temple. How do we know which one of these curtains/veils was torn when Jesus died on the cross? 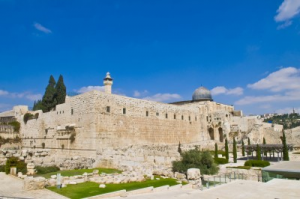 Is there any indication in the scripture that it was the veil that blocked the Most Holy Place? There was the main curtain, the very thick one that this speaks about and it was the one where only the High Priest entered and only once a year. Thank you for the quick response. It makes sense to believe that the curtain which was torn was the one that blocked the Most Holy place. But can I find any direct reference in the bible that this is the case? There is uncertainty as to the exact measurement of a cubit, but it is safe to assume that this veil was somewhere near 60 feet high. An early Jewish tradition says that the veil was about four inches thick, but the Bible does not confirm that measurement. The book of Exodus teaches that this thick veil was fashioned from blue, purple and scarlet material and fine twisted linen. The thickness of the veil would be enough to prevent someone from stumbling into it and accidentally falling into the Holy of Holies (and dying). Much of the Jewish history and tradition support such a thickness. The fact that half a dozen men were said to be required to carry it tells me that it must have been massive. Previous post: Is Jesus A Lunatic, Liar, or Lord?